Below is a list of scholarships for students who are studying in the Department of Film and Media Studies. Some of these scholarships may be used to provide funding for scholarships awarded by the University so may not be offered through the Department’s awarding process. Incoming freshmen and transfer students are not eligible for any departmental scholarships or awards. These students are encouraged to go to the KU Office of Financial Aid and Scholarship (FAS) website to review other possibilities for financial aid. The Department scholarship application will be available online (doc, pdf*) and in 230 Summerfield Hall from February 1–March 1, 2019. Applications are due on or before March 1, 2019. The Department of Film and Media Studies requires students applying for departmental scholarships with a financial need component to have filed a Free Application for Federal Student Aid (FAFSA) or KU’s International Student Need Analysis Worksheet (ISNAW) by March 1, 2019. Students may access the 2019-2020 FAFSA applications directly through the U.S. Department of Education website. The 2019-2020 ISNAW will be available on KU’s Financial Aid & Scholarships (FAS) website. Please contact the FAS if you have questions about which form to fill out. Although the remaining departmental scholarships do not require the filing of a FAFSA or ISNAW, students interested in receiving any financial aid are strongly encouraged to file the applicable form in order to be considered for all types of financial assistance for which they may be eligible. Rising Student Scholars: You were awarded a four-year renewable scholarship by KU Financial Aid & Scholarships when you decided to attend KU. The Department of Film and Media Studies will attempt to help fund the 2019-20 academic year renewable scholarships for all qualifying FMS declared majors. You must complete the FMS scholarship application so the Department committee can determine if you meet criteria for any Department scholarship. This will not be an additional scholarship for you. The FMS scholarship will be applied to help fund the four-year renewable scholarship which was awarded to you by KU Financial Aid & Scholarships. Scholarship and award recipients will be notified at the Department’s annual student recognition ceremony on May 9, 2019 or at a later date by FAS. 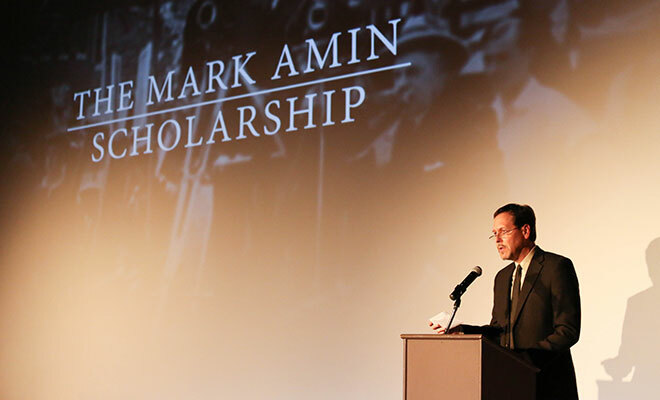 *Mark Amin Scholarship: (Undergraduates and Graduates are eligible) Awarded to Undergraduate and Graduate students with academic merit and financial need. Preference will be given to students of Iranian descent and then to students of Arabian descent. Applicants must file a need analysis form by March 1. Donald and Betty Dixon Scholarship: (Undergraduates and Graduates are eligible) Awarded to undergraduate and graduate students. Candidates must show evidence of academic merit. Adah Clark Hagan Scholarship for Film Students: (Undergraduates and Graduates are eligible) Awarded to undergraduate and graduate students. Candidates must show evidence of excellence in both the academic and creative areas of film and media. Claire Reinhold Scholarship: (Undergraduates and Graduates are eligible) Awarded to outstanding undergraduate and graduate students. Candidates must show evidence of academic merit. *Charles “Buddy” Rogers Scholarship: (Undergraduates and Graduates are eligible) Awarded Undergraduate and Graduate Film students who are U.S. citizens and are not on an athletic scholarship. Candidates must show evidence of financial need and excellence in both the academic and creative areas of film and media. Applicants must file a need analysis form by March 1. *Alexis and Craig Stevens Performing Arts Scholarship: (Undergraduates and Graduates are eligible) Awarded to undergraduate and graduate students. Candidates must show evidence of financial need. Applicants must file a need analysis form by March 1. *Peter and Ann Thompson Undergraduate Film Scholarship: (Only Undergraduates are eligible) Awarded to a declared undergraduate film major. Candidates must have Kansas residency, have a 3.5 grade point average in their major, and show evidence of financial need. Applicants must file a need analysis form by March 1. Women in Film Scholarship: (Undergraduates and Graduates are eligible) Open to Undergraduate and Graduate women with demonstrated excellence in creative work in film and media studies Candidates must have a GPA of 3.7 in Department coursework and 3.5 overall and must show a commitment to pursuing a career in film and media, either studies or production. * In order to be considered for departmental need-based scholarships, the Film & Media Studies deadline is March 1 for domestic students to have filed a Free Application for Federal Student Aid (FAFSA) or International students to have submitted a KU International Student Need Analysis. Below is a list of Department of Film and Media Studies awards and honors. Alumni Honor Citation: Awarded to a KU alum from the Department who has national and/or international prominence and has demonstrated continued significant contributions to his/ her profession. Award of Merit: Awarded to a person who has made a recent significant contribution to the Department. It is intended for a single instance, as opposed to continued service. Marilyn B. Heath Distinguished Service Award: Given to honor staff and graduate students in the Department who demonstrate exceptionally dedicated service to the Department in a given year. Lifetime Achievement Award: Awarded to recognize important contributions in film and media studies in the span of a career.